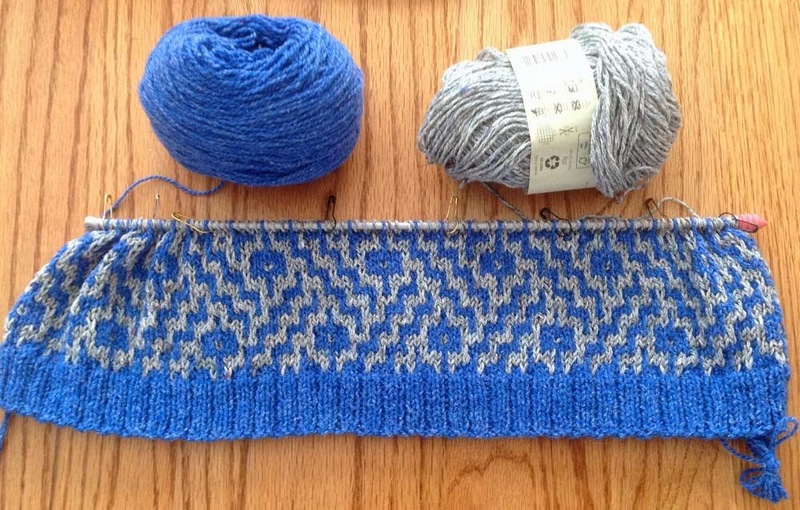 It was great to write to Rowan, and designer Lisa Richardson, about the concerns I had regarding the chart of the Mosaic sweater. Within a day they both responded and now the pattern has been updated. The original offering had a 12-row repeat when it should have been a 32-row repeat. I've now completed one full repeat, working the back of the sweater and if you compare it to the original chart you can spot the differences. The little 'boxes' are now offset and the diagonal lines go to the right and then to the left. You can see the original in the last post. I substituted the Rowan Cotton Glace with Lavold Silky Wool. I'm liking the texture that I'm getting. It's not totally smooth but has a bit of depth between the two yarns. Doing a design in the mosaic/slip stitch pattern has got to be one of the quickest ways to work color. You only work one color at a time and change yarns after every second row. It's very satisfying. I'm going to have a new sweater fairly quickly I think.